A member of the famed Screaming Eagles of the 101st Airborne Division, Donald J. Rich went ashore on D-Day at Utah Beach, was wounded in the bloody conflict at Carentan, landed in a flimsy plywood-and-canvas glider on the battlefields of Holland, and survived the grim siege with the Battling Bastards of Bastogne during the Battle of the Bulge. "Glider Infantryman" is his eyewitness account of how he, along with thousands of other young men from farms, small towns, and cities across the United States, came together to answer the call of their nation. It is also a heartfelt tribute to the many thousands who gave their lives in this struggle. Coauthored by Kevin Brooks, the son of Rich's best friend and World War II comrade, "Glider Infantryman" covers a span of nearly three years; his return home, five months after the war's end, as a toughened bazooka gunner and veteran of five campaigns. 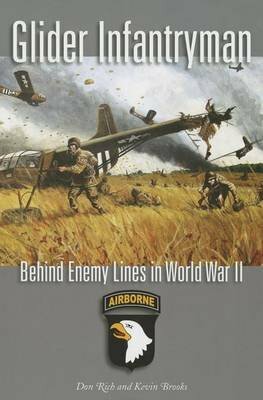 Rich's first-person narrative includes vivid coverage of the action, featuring an especially rare account of arriving on a combat landing zone by glider. Detailed, day-to-day depiction of some of the heaviest fighting in Holland follows, including the action at Opheusden, the center of the infamous Island. Later highlights include the Battle of the Bulge, where Rich recounts his experiences in some of the hottest defensive fighting of the European Theater, including the epic tank battles at Marvie, Champs, and Foy.